I’ve finally decided to make the source code for MojaviBuilder freely available. I’m not going to be doing any more work on it (unless directly asked to), so I’m makaing the code available for anyone that wants to tinker with it or completely re-write it if they so desire. Given that I had only just learnt VB.Net there are a few bits that I’m not terribly proud of, but its mostly alright. It is written in VB.Net for the MS .Net framework 1.1. It should be possible to compile it for the Mono framework without too much difficulty which will give you a cross platform version. Please note that I did put a fair amount of work into this app so please give credit where credit is due if you re-use any of the code. You can download the source code directly, or from my downloads page where you will also find links to my other available downloads. Disclaimer: Please note that I am not responsible for any damage to any computer system as a result of software source code or any other media that is downloaded from my website. Every effort has been made to ensure that all downloads are virus free and that no malicious code is included in downloads but it is the responsiblity of the end users to ensure that what they are downloading is safe for use on their computer system. Having subscribed to the MWF blog I noticed today that they have finally posted a new entry. Whilst this in itself isn’t too interesting, some of the information in the entry is interesting. Firstly, the MWF (Microsoft Windows Forms) project for Mono is now up to 98% complete. Most of the basic controls are now complete. The second interesting piece of information is that you can now get a Live CD for mono. The CD is freely available as an ISO which can be downloaded directly via HTTP or via BitTorrent (see www.mono-live.com). The upshot of all this is that hopefully MojaviBuilder will now run under Mono. I have downloaded the ISO via BitTorrent which I’ll burn to CD when I get home and then have a go and running MojaviBuilder. If it does run then I’ll know I can go continue developing MojaviBuilder in .NET 1.1 safe in the knowledge that I can be run under Windows, Linux, and MacOS. I recently signed up for a free Subversion hosting account with CVSDude for hosting MojaviBuilder. I have also made some initial commits to the repository to get the ball rolling. Unfortunately the free account from CVSDude only allows for one developer account per project. They do, however, say that non-commercial projects can get free account upgrades, so I’ve sent them an email asking for extra accounts, I didn’t, however, ask for extra storage space as I would like to keep the source code to MojaviBuilder tight so I’m going to try to stick to the 2Mb limit. I sent the request at about 11am GMT and I haven’t heard anything back yet, which isn’t really suprising as CVSDude is run out of Australia. In the mean time, does anyone know of any good free Subversion hosting? I don’t get paid for developing MojaviBuilder so I don’t have a lot of money to pay for things like Subversion hosting accounts. I’m thinking about making MojaviBuilder semi open source. If I do go with my idea I’ll get a Subversion hosting account with SVN-Hosting.com for $5 a month and up load the current source code for MojaviBuilder which will act as the central repository. Then if any developers wish to get the source code to make a port to Java, etc. or anyone wishes to make chanegs then they can request an account from me to allow them access to the code. I must point out that this is only an idea. Please also bear in mind that I will be paying for this out of my own pocket. If you feel strong that I should go ahead with this idea then please leave a comment. I’ve finally got around to taking a look at #develop… the open source .NET development environment. I first became interested in #develop because someone pointed out to me that they have a syntax highlighting editor that I could use in my own projects. At the point however I hadn’t done that much in the way of .NET development so could figure out how to take the texteditor out of the #develop project and drop it into my project. Last night, howver, I managed (in #develop) to create a simple notepad editor based on the texteditor in #develop and have it highlight my PHP code. The PHP language definition file still leaves a lot to be desired but it is progress none the less… watch this space for more info. Sean Kerr (the guy that created Mojavi) has release the API documentation for Mojavi 3.0.0-DEV. The latest stable version is 2.0.0. Because of the request for a PHP 5.0 compatible version of Mojavi, development has been started on Mojavi 3.0. Mojavi 3.0 will take full advantage of PHP 5.0′s new object-oriented features and will be developed in the 3.0.0 branch. I guess I’ll have to start work now on making sure that MojaviBuilder can generate Mojavi 3 compliant class files. Maybe this would be a good time to get MojaviBuilder 2 back on track after putting it on the back shelf for a while. I have finally sorted out syntax highlighting in VB.NET for PHP code. It took me a while and the final result is a bit of a hack but it works and I’m proud of it!!!! The syntax highlighter seems to work fine with the amount of code that I’ve got in my templates, but put too much code in and the performance seems to lag a bit. The application is made up from one main window… the project window. 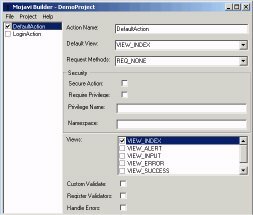 Down the left side is a list box which contains the actions in the list of actions in the current project, and also shows which is the currently selected action. The reason for the creation of this tool is automate the creation of all the files required to make a Mojavi based PHP application. The bad news for those of you that don’t run WIndows is that I will be continuing development in VB.NET. The reasons for this are that (1) I know VB.NET and (2) I don’t have the time to spend on writing and supporting it in any other language. I will try to keep the components that I use to the standard Microsoft ones in the hope that when Mono goes GUI it will be able to support MojaviBuilder, but beyond that I can’t promise anything. If you have any strong feelings as to what should be included/excluded from MojaviBuilder 2 please leave a comment and I’ll see what I can do.